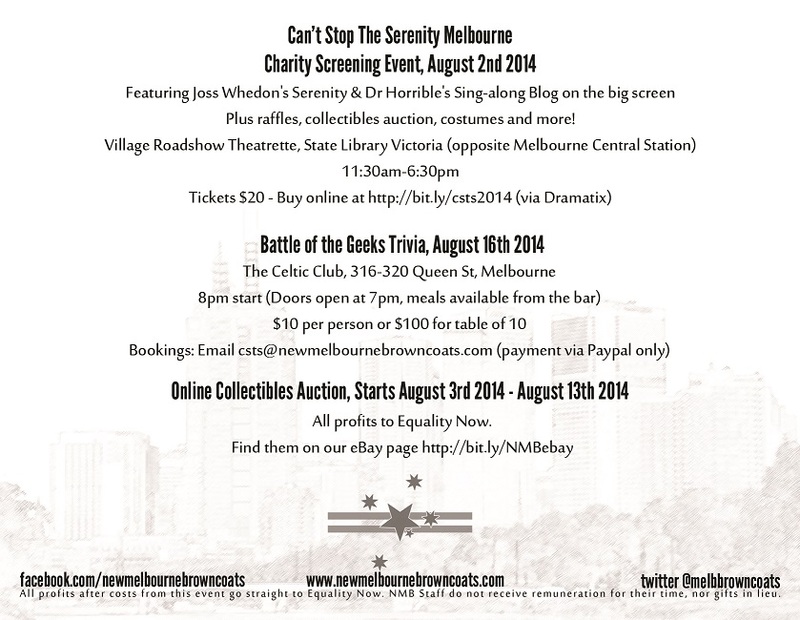 New Melbourne Browncoats, Inc. | One week until Can’t Stop the Serenity! Help us sell out and win prizes! Test your knowledge and prepare for the Battle of the Geeks on August 16! Enter the CSTS Melbourne Cosplay Contest and Win a $50 Costumes.com.au Gift Voucher! One week until Can’t Stop the Serenity! Help us sell out and win prizes! There’s just one week to go until Can’t Stop the Serenity 2014 breaks atmo on August 2 in Melbourne! We’ve sold out for the last two years, and we’re hoping to do so again in 2014. To do this, we need your help! If you’ve attended before, you will know that we always have a door prize for one lucky ticket holder at the event. This year, we’re doing something a little different. When we hit 150 tickets sold, we’re adding a second door prize. And again when we hit 170 tickets, 180 tickets, 190 tickets and sell out at 200 tickets! That’s a chance at one of six door prizes that you can win! But in order to increase the chances that attendees can win, we need your help to sell more tickets! Tickets are just $20 and for that you get a full day of entertainment! •	And much much more!! And all proceeds will be donated to Equality Now, to help promote the rights of women and girls around the world. So get your ticket today if you haven’t already, and then tell your friends! The more tickets we sell, the more prizes we’ll have up for grabs!